What brings you back to Somerset for another stint in county cricket? Azhar: "The biggest thing for me is the opportunity to learn from team-mates, from opponents, and, also, it's another great chance to play high-quality cricket in unfamiliar conditions. In addition, it's a chance to share your experience and knowledge with your team-mates, so it's really a two-way learning exercise. On top of that, county cricket is a highly competitive form of cricket, and it's a chance to keep your practice levels up and fine-tune yourself in between international matches." What are your targets with Somerset this season? 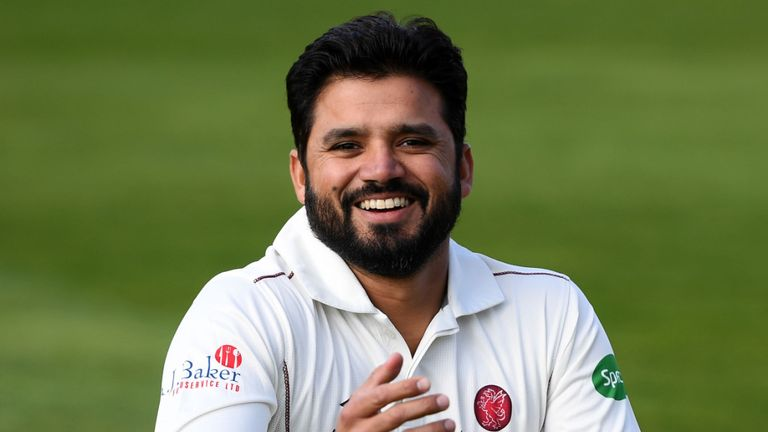 Azhar: "The main target has to be to win the County Championship, and that is something that I hope I can help Somerset achieve this time around. I've arrived early for the start of the season ahead to acclimatise, and I can't wait for the season to start. I think the Somerset squads are very strong in all three formats, and I believe we can challenge for honours in all three formats." Do you think Somerset have the strength in depth? Azhar: "Yes - it's superb. What I really feel is outstanding for our side, and a factor that could prove crucial, are the fitness levels of the squad. Some teams may be more suited to either white-ball cricket or red-ball cricket, but I honestly believe that this squad has tremendous ability in all formats. I don't see any weaknesses in the squad, and the competition for places and the skill level in all facets from what I have seen is excellent. We had a good season last time around and we were there or thereabouts, but I feel if we make some slight improvements, we could be challenging for the top position this year." What can Pakistani domestic cricket take from County cricket? Azhar: "There are lots of positive ideas and changes being spoken about for Pakistan domestic cricket and I feel that is a good thing. It's mainly about improving the quality on the domestic circuit and nurturing and guiding the abundance of talent we have in Pakistan. I'm very optimistic about the future of Pakistan domestic cricket and am hopeful that there will be some positive changes." It seems, doesn't it, that against-all-odds Pakistan continues to produce young and raw cricketing talent? Azhar: "That's very true and we have seen that recently in the Pakistan Super League with Mohammad Hasnain and Umer Khan. The more opportunities are given to young upcoming cricketers in Pakistan, the better the standard will become and this talent will become polished much quicker. These guys are the future and Pakistan cricket needs them to serve the country for a long time." As a current Test cricketer, are you concerned about the future of this format? Azhar: "No, I think the concerns are being exaggerated. If you look at crowds in Australia and England, they are still huge and stadiums are packed. Yes, in some parts of the world like the sub-continent attendances are poor and of course in the UAE the local population are limited in which times and days they can attend matches so that affects attendances. People are saying that the popularity of Test cricket is being affected by the other formats gaining popularity, but I feel that Test cricket is still a very popular format and remains strong in the eyes of cricket fans around the world." Is day/night the future of Test cricket? Azhar: "I think it's good that the people who run cricket are trying new ideas and being innovative. However, despite enjoying a good performance in day/night Test cricket and experiencing it in a positive way, I am someone who prefers Test cricket played in the traditional way." Describe the pain of not being able to play international cricket in Pakistan. Azhar: "People should not underestimate just how difficult it is. You are constantly playing cricket away from home venues, away from your friends, away from your family and your fans. Playing in front of your own fans, your countrymen is what every sportsperson yearns and dreams of and you get a lift from playing in your own country in front of packed stadiums as we have just seen in Karachi at the Pakistan Super League. Only those who cannot play in front of their own crowds know just how tough this is and how heartbreaking it is." After the successful hosting of PSL matches in Karachi, do you believe Pakistan is ready to host international cricket? Azhar: "The signs are very positive and I hope that the world of cricket is now ready to trust Pakistan and tour there. We have seen a World XI play in Pakistan, Windies also tour Pakistan and of course the hugely successful 8 PSL matches in Karachi that saw many overseas players, ICC officials and commentators visit the city. The signs are great and I feel that a positive message has gone around the world regarding international cricket returning to Pakistan soon." Why have Pakistan plummeted down the ICC Test rankings? Azhar: "You come across good and bad phases as a team in any sport and there will be times when you struggle. There is a lot of potential in the team and I think it's only a matter of time before we get our act together again get back to winning ways. We have shown in the past that we can win Test matches in UAE and away from home too, but then we lost two very senior players in Misbah-ul-Haq and Younis Khan and I have also been out of form, and I feel that has hit the team hard. Admittedly, I have struggled for form after my knee injury and you could say that these things have all come together and had a big impact on our performances in Test cricket. I think we are over the worst and we will regain our confidence and get back to winning Test matches in the near future." Critics feel that your knee injury will mean that you will never be the same batsmen you once were. Azhar: "I don't think that is the case. With a knee injury, it will always flare up now and then, but I feel fine now and am raring to go again. Sometimes form can be related to fitness, but I'm happy with my recovery from injury. I thought I batted well in New Zealand and regained my form there, but then I struggled in South Africa, which was disappointing. But I'm here at Somerset and it's a good opportunity for me to keep working on my form and fitness during an international break." Win at home and lose away from home seems to be the motto for Test teams nowadays. Why do you think that is? Azhar: "If I look at the example of Pakistan, then that is down to the fact that we have a number of new players in our Test team and many of them have not toured places like South Africa before and that's why we struggled there. In fact, only three members of our Test squad in South Africa had toured there previously. In addition, we have not been having many 'A' tours to places such as South Africa and that is so important. However, now with more 'A' tours planned I feel that the performance level of the Test team will improve as players will have more experience of different conditions around the world. I think it's easy to criticise teams for not performing in overseas conditions, but also some issues are historic and Pakistan has never really performed well in South Africa over the years." With the World Cup around the corner, have you any regrets about retiring from ODI cricket? Azhar: "No - I'm a firm believer that whatever happens, it happens for the best. Of course, you want to play as much as you can for your country, but when guys like Fakhar Zaman, Imam-ul-Haq, Abid Ali, and Shan Masood are performing and playing well, then they deserve to play in the World Cup ahead of me. "In my case, when Fakhar and Imam were doing so well, I thought it was the right time to call it a day in the 50-over format, and at the same time rest myself for Test cricket. I think we should all back the likes of Fakhar and Imam, and wish them well at the World Cup. I think it's always best to retire with respect rather than being forced out. When you are playing Test cricket, you don't want to focus on making a comeback in other formats, so I made a clear-minded decision to concentrate only on Test cricket in future, and I am comfortable with this decision." Pakistan stunned the cricketing world in 2017 to lift the Champions Trophy. Can they do the same this year at the World Cup? Azhar: "I actually believe that Pakistan has a better chance to win the World Cup this time around than we did two years ago at the Champions Trophy. Back in 2017, nobody gave Pakistan a chance, but this time around people are mentioning Pakistan as potential winners of the World Cup. I think Pakistan has a very good chance, providing the team clicks. The combination for Pakistan is very good, but it's all about clicking and peaking at the right time, as we did in 2017. The World Cup this time around is a long tournament, so you have a bit of time to find your feet and peak. "Pakistan is strong in all areas, but the key will be getting a solid base from the top-order batsmen and getting runs on the board for the bowlers to work with. Pakistan's bowlers are always strong, and this time is no different. As we saw at the Champions Trophy, you can't write off Pakistan in any tournament. I'm very hopeful and think they will do well, as I think they have a stronger squad than they had at the 2017 Champions Trophy." Who do you see as the main contenders for the World Cup? Azhar: "I think India, Pakistan, Australia, and South Africa are the main challengers, although I don't think New Zealand should be written off, as they always tend to perform well at World Cups. I think the winner will come from one of these teams. But then this is cricket, and anything is possible, and whoever runs into form and peaks at the right time will come out as champions."